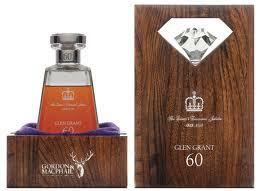 A whisky specialist has launched a 60-year-old single malt to mark the Queen’s Diamond Jubilee. Gordon & MacPhail in Elgin, Moray, has released 85 bottles of Glen Grant 60 Years Old, which were distilled on February 2 1952, four days before the Queen acceded to the throne. The whisky was bottled on February 2 this year, making it exactly 60 years old. The limited-edition bottles are being put on the market for a recommended retail price in the UK of £8000 (A$11,835) each. Michael Urquhart, joint managing director of Gordon & MacPhail, said: “Glen Grant 60 Years Old is a rare single malt whisky and we are delighted to be releasing it to mark the celebration of Queen Elizabeth II’s Diamond Jubilee. “With whisky of this quality and rarity – each bottle comes with a certificate of authenticity – we expect considerable interest, not just in the UK, but from the international marketplace where recent export figures have shown we have an avid consumer following.